The analysis of point patterns appears in many different areas of research. In ecology, for example, the interest may be focused on determining the spatial distribution (and its causes) of a tree species for which the locations have been obtained within a study area. Furthermore, if two or more species have been recorded, it may also be of interest to assess whether these species are equally distributed or competition exists between them. Other factors which force each species to spread in particular areas of the study region may be studied as well. In spatial epidemiology, a common problem is to determine whether the cases of a certain disease are clustered. This can be assessed by comparing the spatial distribution of the cases to the locations of a set of controls taken at random from the population. 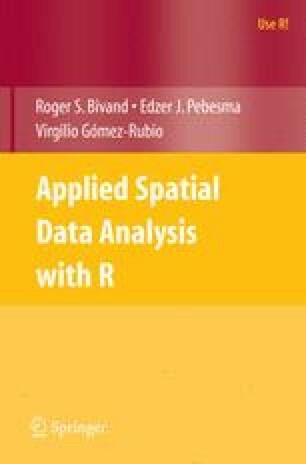 In this chapter, we describe how the basic steps in the analysis of point patterns can be carried out using R.When introducing new ideas and concepts we have tried to follow Diggle (2003) as much as possible because this text offers a comprehensive description of point processes and applications in many fields of research. The examples included in this chapter have also been taken from that book and we have tried to reproduce some of the examples and figures included there.